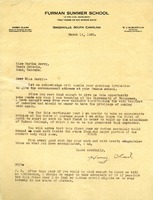 Martha Berry responds to Harry Clark's previous letter in which he explained why he could not be the Berry School's commencement speaker in May, 1930. Martha Berry thanks Harry Clark and wishes him success in his new job. Harry Clark (H.C.) thanks Martha Berry for inviting him to give the commencement address at the Berry Schools. This would be H.C.'s second commencement speech, however he is unable to attend because he starts a new job at Judson College (Alabama) and does not want to miss work. 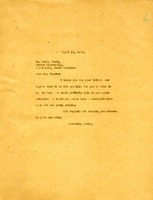 Lastly, H.C. requests that Martha Berry invite him to speak at a commencement exercise in the following year.